A light bar is a series of bar-shaped LED lights held within a strip of plastic or other material. They’re a popular aftermarket accessory for trucks because LED bars provide both practical capabilities as well as cosmetic appeal. LEDs also provide advantages over traditional incandescent lighting, especially for vehicles. 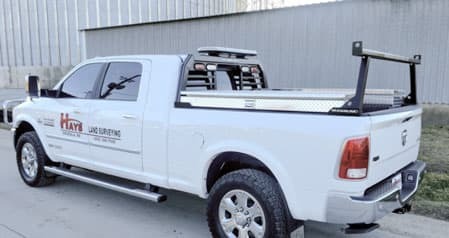 LED light bars for trucks are commonly installed in a variety of places on a truck including your truck’s headache rack. The primary disadvantage of incandescent lighting for vehicles is its inefficiency. These lights draw power from the vehicle’s electrical system, which requires the engine to work harder and use more fuel. LED lights typically uses 1/3 the power of the equivalent incandescent bulbs. Magnum offers a 50″ LED Double Row Light Bar that can be added to an existing Magnum Rack Glide Track. This light bar features 100 3-watt high-performance LED lights, which provides 20,000 raw and 13,489 effective lumens. This is done while only using an insufficient 17.6 amps from your truck’s system. Magnum’s light bars offer versatility, ease of use, and serious durability. LED lights also provide greater visibility than incandescent bulbs since their color temperature is more similar to natural lighting. Magnum’s light bars are created with high-impact polycarbonate lenses which resist yellowing. Our light bars also meet the IP-67 dust and water immersion rating. LEDs have characteristics that make them safer to use than incandescent bulbs. The efficiency of incandescent bulbs means that much of the electrical energy that the bulb receives is converted into heat rather than light, which is why they get so hot. Furthermore, incandescent bulbs require more time to turn on than LEDs. An incandescent bulb requires about 1/4 seconds to reaches maximum brightness, while LEDs turn on almost instantly. This delay can be critical in emergency situations such as a driver braking without warning. A light bar for a tailgate is typically installed on the bottom of the tailgate so that it’s just above the bumper. These light bars are used as brake lights to provide additional warning to other drivers during braking. Some owners also use tailgate LEDs as running lights to indicate that the vehicle is in operation. Tailgate LEDs can increase your truck’s overall visibility by connecting them to other lights such as hazard lights, reverse lights and turn signals. They are normally red when serving as running lights, although they can become brighter when used as brake lights or turn signals Tailgate LEDs can also turn white when you back up. Trucks with a high ground clearance, often times that have a lift kit installed, sometimes have a step on the bumper to help passengers climb into the cab. LED lights on the bumper allow passengers to find the bumper step at night. Like tailgate lights, bumper lights can also mirror the behavior of other lights by becoming brighter or changing color. Rear bumper lights also help drivers who frequently use their trailer hitch for hauling. Having additional rear-facing lights makes getting hitched to a trailer, or other piece of equipment easier than ever. Rear bumper lights can also help protect your truck’s bumper from hitting another object when backing up. Spotlights make the truck easier to see at night, especially in circumstances of poor visibility such as working off-road or rough weather conditions. Magnum’s LED rectangular utility flood light provides the right amount of light, exactly where you need it. Spotlights are often used when short range light output is required. Spotlights typically have sturdy housings that allow them to be securely mounted to the front of the truck. Some truck spotlights can be grouped together in various ways to further increase their lighting intensity and create an eye-catching look. Drivers often fail to notice a truck’s brake lights immediately when it only has one brake light on each side of the truck. A third brake light in the middle of the truck can get the attention of other drivers more quickly since they’re more likely to be looking at this location. 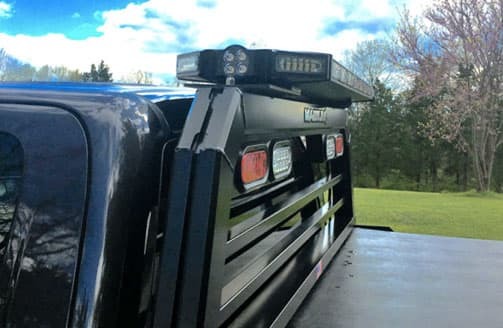 LED light bars on a truck’s hood, cab and grille provide greater visibility for the front of the truck in the same way that tailgate lights increase visibility in the rear. These lights also give the truck a more stylish appearance and an off-road look. The most common installation locations for hood and cab LED lights are on the front of the cab above the windshield or in front of the hood. The primary reason to place LED lights on your truck’s grille is to increase cosmetic appeal. Often times aftermarket grilles have LED lights included, so they don’t require additional installation if you’re already replacing your stock grille. A light bar can be used in a variety of different areas on a truck to provide a truck driver with additional lighting. Additional lighting also achieves a cool, off-road look as well. LED lights are superior to incandescent lighting because they require less energy from the vehicle to run, and they also give off a more natural light. LED lights typically uses 1/3 the power of the equivalent incandescent bulbs.